Spring is here, which in Traditional Chinese Medicine terms is a time of new growth and forward movement. A time for cleansing and clearing of the old and welcoming in the new. I hope that your are enjoying the nicer weather with your animal companion and having some fun. If it’s raining don’t forget the rain coat for you and your dog, they know it helps. Professional animal communicator Nedda Wittels has written a few articles that I am very pleased to add to my library section. If you have an interesting article you would like included please just contact me and I can add it. I’ve been busy with radio and TV interviews, long distance reiki sessions and animal communication. I hope I have time to add another labryinth this year. Thank you to the Kid Carson Show on 94.5 The Beat, in Vancouver BC for the opportunity to share animal communication with their listeners. Special congratulations to Megan who was the first listener to contact me and was the winner of an animal communication session. Soon to be posted on the video blog. Tips for Litter Box Management– Is your cat having some litter box issues? I am pleased and proud to present fellow animal communicator Nedda Wittels. M.S., M.A., Nedda is an internationally known Animal Communicator, Shamballa Master, Light Worker, and Teacher. She has written this very insightful, and helpful article that has some great suggestions I hadn’t seen before. Our senior cats have some special requirements that we can easily provide for if we know what to do. Nedda has written several helpful articles that will be highlighted here. Help for Biting Dogs– “Nipping and Biting are normal behaviors in the world of the wild dog, coyote, or wolf. When living with humans, however, these behaviors are unacceptable. How can we help our dogs give up their natural ways of communicating and interacting with one another? ” Animal communicator Nedda Wittels again offers her helpful insights on a potentially volatile situation for both the dog and their human companion. I built a labryinth last spring by mowing the pattern in my front field. It was fun to build and maintain and was amazing to walk. 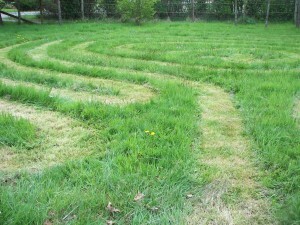 Labyrinths have been a part of healing for years and you can usually find one at a local church or hospital. Animals like them too and enjoy the energy and release that can be felt by walking in the concentric patterns. More about horses and labryinths later, it can be an incredible training aid that can be fun to walk as well. Practice Animal, Millie – I hope you enjoyed practising your animal communication skills with Millie. You can read about her here and compare your notes. 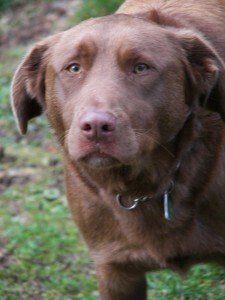 She is a happpy, dog and loves to play in her fenced yard. 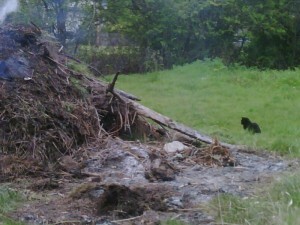 Her yard is fenced in high page wire and there is large fir and cedar trees along with a big sandbox area where she buries her food. Her favorite toy is a ball on a rope that she will bring you to throw. She loves to be with her 3 boys and likes to sneak on the trampoline when you’re not looking. She likes to come inside and be a part of the action but she gets excited and can knock over the boys with her enthusiasm. She likes to go for walks with her human Mom and boys, and loves to go out with her Dad when he goes on the quad. If you would like to have more info validated please just email. Thank you. When I communicate with animals there are a few messages that come up fairly consistently and one of them is that they like to have lots of clear, fresh water in a clean bowl or container. More is always better…they’ll definitely love this! Healthy Cat Treats – This month it’s time for a healthy cat treat recipe…do you have a favorite you’d like to share? Decadent Catnip Treats – Your cat says hands off, they’re all his! Preheat oven 350F Expect about 4 doz. little thank you’s! Mix the dry ingredients together then add the wet mixing slowly until you have a soft dough. Roll out on a lightly floured surface till about 1/4″ thick. Cut with sharp knife or pizza cutter into small bit size pieces. Transfer to a greased cookie sheet and cook for 10 min. or slightly brown. Store in air tight containers or in the freezer till you cat tells you he needs some more. Cool the treats and after your cat’s approval (the taste test) store in air tight containers or freeze till he tells you to get some more. Is your animal spayed or neutered? Did you know that a female dog and a male dog and their offspring can produce 4372 puppies in 7 breeding years? If you are interested in animal communication and have any questions please do not hesitate to contact me. If you would like a animal communication session or a reiki treatment, either long distance or in person for your animal companion you can read more here.